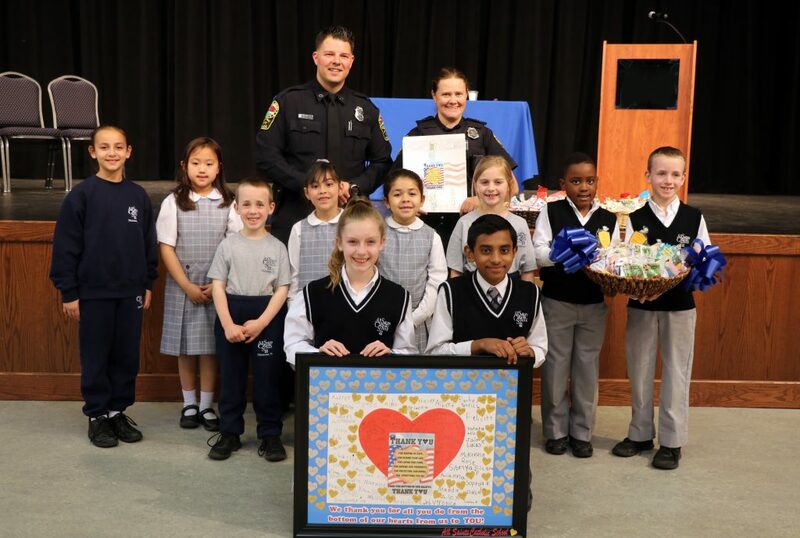 As part of our Year of Kindness activities and recent focus on “kindness to the community,” All Saints students made a special presentation to the Manassas City Police Department to show our appreciation for all they do for our community. Students in every grade level took part in activities to thank the members of the police department for their service and partnership with our school. A framed poster was signed by students in Pre-Kindergarten through 2nd grade, students in 3rd – 5th grade made large-size class cards, and middle school students assembled baskets of snacks with positive messages written on each treat. The presentation was made at the end of our National Junior Honor Society Induction Ceremony to tie-in with the importance of leadership as exemplified by the members of the Manassas City Police Department.